Now we come to a section of the Bible that is primarily history. Other sections contain history mixed with laws, poetry or prophecy; this section is almost all history. It follows the people of Israel as they moved into the Promised Land. Under the firm and faithful leadership of Joshua, the Israelites made steady progress in occupying their new territory. The seemingly impregnable city of Jericho fell miraculously into their hands. 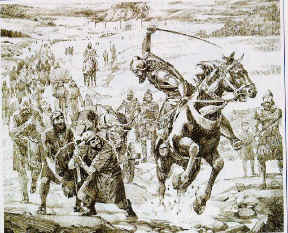 However, they were unable to gain control of the fortress city of Jerusalem. It remained a stronghold of the Canaanites for several more centuries. Then, as now, this city was a coveted but difficult place to conquer. Before Joshua died, he reminded the people what God had done and would continue to do for them if they remained faithful to the terms of the covenant (Joshua 24:13-14). Israel’s faithfulness did not continue. After Joshua and the pioneers who had shared the wilderness experience died, the tribes began to drift into idolatry (Judges 2:7-11). The book of Judges shows what happened in subsequent generations. It chronicles the tragic results of the people’s inability to remain faithful. Whenever the Israelites forsook God and his commandments, they suffered oppression from the nations around. Some tribes would be oppressed by one enemy, other tribes by another. In desperation, they would call out to God to save them. God would appoint a strong leader (or “judge,” hence the name of the book) to drive out the oppressors. This cycle of unfaithfulness, oppression, repentance and deliverance repeated several times in several regions. The lives of several judges are featured. You may have heard of some, like Deborah, Gideon and Samson. Others such as Barak and Othniel are not so well known. If you explore this book in detail, you will discover that the Bible tells both sides of the story — good and bad. Israel agreed to obey God and become a good example to the nations around. But they were no better than anyone else. When they forsook God and his laws, they suffered the results — and became a bad example. They were a violent people living in a violent age. By the end of the period of the judges, the Israelites were not much closer to occupying the land than they were when Joshua died. The incidents in this book point to an important lesson. Israel’s situation is summarized in the final verse of the last chapter: “In those days Israel had no king; everyone did as he saw fit” (Judges 21:25). At that time, when most people were doing what was right in their own eyes, the story of Ruth is a refreshing change. Ruth followed the God of Israel even though she was not from Israel (Ruth 1:16). Her inspiring example of loyalty was rewarded in a remarkable way: From her marriage to Boaz came a line of descendants that included Israel’s most famous kings, David and Solomon — a line that led to Jesus Christ. The books of Samuel pick up the story where Judges left off. Samuel was the spiritual and political leader used by God to guide the nation. Whereas other nations had a human king, Israel was a theocracy. But the Israelites decided they wanted a king like other nations. A dismayed Samuel warned them of the consequences, but to no avail (2 Samuel 8:7). A monarchy was set up in which a line of kings would determine the fate of the nation. Saul, the first king, turned out to be disobedient, and God chose David as the next king. 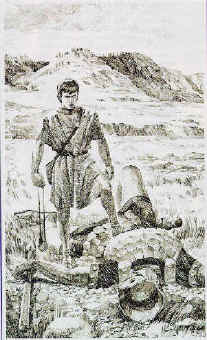 Most people are acquainted with the faith of David in confronting the Philistine giant, Goliath (1 Samuel 17:37). David demonstrated repeatedly that he was a man after God’s own heart, and God promised that his descendants would also be kings. David was not a perfect leader, but his heart was right. Though the Bible describes many of his sins, David always repented sincerely, with his whole heart. He expressed many of his deepest emotions in poetry and songs. Many of them are preserved in the book of Psalms. We will take a closer look at the book of Psalms later. With David began what some have called the golden age of ancient Israel. For centuries the nation’s position in the Promised Land had been precarious, surrounded as they were by war-like and resentful enemies. David subdued these enemies, and captured a strategic city in the center of the nation: Jerusalem. David made it his political and religious capital. Solomon inherited from his father David a rich and prosperous kingdom, with secure borders straddling the major trade routes between Egypt and Mesopotamia. Under Solomon, Jerusalem became a showpiece city. He built palaces, parks, government buildings and a magnificent Temple in honor of God. But as Solomon’s wealth and reputation grew, he allowed his wives and harem to turn him away from God. Solomon’s life began with glittering success but ended in frustration and failure — and in the division of his kingdom. Israel split into two kingdoms. The northern tribes retained the name Israel, while the southern tribes became known as the Kingdom of Judah. Two separate lines of kings ruled Israel and Judah. A few of these kings proved faithful to God, but most led their nations further down the road to idolatry and ruin. God sent prophets to remind his people of their covenant relationship with him. Among the early prophets were Elijah and Elisha. But, though accompanied by miracles, their warnings were scorned. The people worshipped other gods, and failed in their social responsibilities. As Israel and Judah stumbled along, powerful empires stirred around them. To the southwest, Egypt, Israel’s old oppressor, was still a powerful nation. To the northeast, the Assyrians, a fierce and aggressive people, became the dominant power. Through the prophets, God warned Israel and Judah to change their ways or lose their inheritance. God’s people ignored the warnings. In the late eighth century B.C., Assyria invaded the northern kingdom, taking the people into captivity and exile (2 Kings 17:6-7, 18). The Assyrians besieged Jerusalem, but Judah’s king, Hezekiah, asked God for help. God miraculously turned the Assyrians back and saved Judah. But it was not long before Judah lost their trust in God. The southern kingdom limped along for another 120 years before being invaded, conquered and enslaved by the Babylonian empire. So the chosen people wound up back where they started — slaves and refugees. They failed to keep their covenant with God. Like Adam and Eve, they chose to disobey, and they suffered the consequences. Next in the Bible sequence we find the books of 1 and 2 Chronicles. They parallel the books of Samuel and Kings, with special attention on the reigns of David, Solomon and the kings of Judah. In 539 B.C., the Babylonian Empire fell to a combined force of Medes and Persians. Unlike the Babylonians, who deported conquered peoples, the Persian emperors encouraged displaced populations to return to their homelands and reestablish their cultures. The book of Ezra tells the story of the Jews who, by royal decree, returned to Judea and began to rebuild the Temple for the worship of God (Ezra 1:2-3). When Ezra reached Jerusalem, he found that many of the people had drifted back into the errors of their ancestors. Would they ever learn (Ezra 9:1-3)? 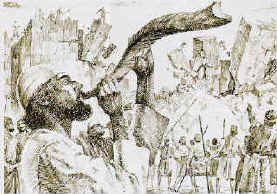 Ezra instituted a great revival in which he acknowledged his people’s sins and asked God to renew the covenant. About this same time, a Jew named Nehemiah attained a high position in the Persian court. When he learned that the work of rebuilding Jerusalem had bogged down, he asked the emperor to allow him to help. Nehemiah and Ezra worked together to restore the city. They, with Zerubbabel, helped the small community of Jews to establish themselves in and around Jerusalem. 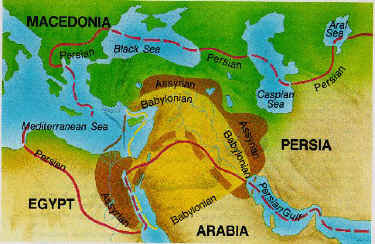 The Assyrian, Babylonian, and Persian Empires. Last among the Old Testament historical books is Esther, which relates how a courageous young Jewish woman saved her people from genocide in Persia. The book of Esther shows that God had not abandoned his people, even though they were in exile. This completes most of the history of Old Testament Israel, but there is much important material still to notice in the Old Testament. Stick around as we continue our tour!